As you may know, the time between Rosh Hashanah and Yom Kippur is often referred to as the 10 Days of Awe, and Holy Spirit does a lot of special work during this time. For me, He has been sitting on me to prophesy more than ever before. Today, He gave me the three prophetic words below. I believe they will encourage you; Papa encouraged me as I was writing them! Glory! The Lord is near you; He is in your heart; He surrounds you with songs of deliverance. Deliverance will come quickly as Holy Spirit moves on your heart to bring freedom. Anoint yourself with oil and arise, for the anointing breaks the yoke. I see the wind of God pushing His provision toward you. With every gust of wind, Holy Spirit is breathing more revelation into your heart about who He is. He is increasing your faith right now–not only faith in Him to provide, but simply faith in who He is. I see that as you move with this wind toward Father, you will be filled with joy. I see you running toward Him like a small child, arms outstretched. I see you come into His outstretched arms, where He picks you up and swings you around in a big circle through the air. His joy is in you, and you are delighting in Him. It is from this place of pleasure and delight in Father’s arms that you will see all things clearly, and all things will be made new. The Lord is coming to you. He is coming swiftly, riding upon His wind. Notice it. Sense Him. Run out to meet Him, and you will find yourself enraptured with Him. Everything that He has is available to you in that place, and you will be so enraptured with Him that you will not remember how it felt to do without. His abundance will become your abundance as you delight in Him. Everything that belongs to Him is yours also. The Lord says, “I desire to crown you with many crowns. As Christ is, so you are you on the earth. He is the apple of My eye, and you are in Him; therefore, so are you the apple of My eye. You are My people, and I desire to use you to demonstrate My goodness and My royalty on the earth. To do that, I must crown you. Please let Me do so. I desire to crown you with glory and honor. I desire to set you over all the nations of the earth. I desire that you should lend to many nations, but never borrow. I desire that you should demonstrate My royalty and how I treat My children. But you must be willing. You must be willing to be set over everything you touch. You cannot maintain the attitude that you are less; that you have less; that you are as a grasshopper among giants. You have wandered the wilderness long enough. So I say to you, ‘Arise! Shine! Your light has come, and My glory has risen upon you!’ Let the people who are in darkness stay there if they must, but YOU shine with My glory. Glory hallelujah! I’m excited about these words myself! Did one or more of these words speak to your heart? If so, please leave a comment below and share your thoughts! Praise God! Wow! All 3 of these Words are for me 🙂 And very timely! Thank you, Father and thank you, Jamie for releasing His Words! Thank you, Jamie! I sent you an email about something painful I was experiencing and how a prayer you suggested caused the situation to dissolve. The very first prophetic word in this post had me glued to my seat! It spoke directly to that circumstance. Words can’t describe how I am amazed at how God is pouring out revelation to help me deal with this situation from a heavenly perspective. I really need prayer support though and it would be much appreciated. I felt in my spirit all 3 of this prophetic is speaking to me. I thank the Holy Spirit for leading me to this page in Jesus name. I thank you for the series. So much joy in my heart. Thanks for the prayers. All the prophetic words were applicable but number 3 made my spirit leap. It was so on. Now is the time that He has been preparing me for. I say yes I’m willing!!! More than a Conqueror ??? Oh my, most of these words I spoke to The Father over the past few days – Isaiah 60:1 – I will arise and shine for the glory of the Lord is risen upon me, etc. Thank you Jamie, I feel strengthened and encouraged. 2 & 3 spoke to me! I am excited about what Daddy God is going to do through and in me! I make myself available to Holy Spirit. Glory to our Father. Thank you for listening ear.? Jamie, I first read one of your messages on the Elijah list a few months ago. Since that time you have been a daily source of encouragement to me in my relationship with Daddy God, Jesus, and the Holy Spirit. Blessings on your continued ministry. #1 word spoke to my heart. Thanks for sharing. Thanking the Father for your obedience to His Word! Number Three is definitely a word for me. I have printed it out. I so needed to hear from Him–thank you for being His messenger for me today. I identify with #2 and #3! In tears as I type this, I thank God for His faithfulness towards me. I an open to receive every bit of these prophetic words and pray to be responding shortly with testimonies!!! May God continue to bless you for sharing these words! Thank you so much!! Every word was just for me! I loved every word. God has spoken and I receive. In Jesus name Amen. Hey Jamie, all 3 were for me. I enjoy reading what Daddy gives you to give to his children. I RECEIVED EVERYTHING IN JESUS NAME. I FEEL IN MY SPIRIT THAT DADDY IS GETTING READY TO OPEN THE WINDOWS OF HEAVEN FOR ME. LOVE YOU. Hi Jamie may the good lord, continue to bless you and your family, those 3 words were for me ,especially 1,2.. the enemy had me but not anymore hallelujah, I know he comes to kill, steal and destroy but god comes to give you light ? Oh Jamie!! ALL of these spoke to me! #1 was confirmation of the same Word I already received this morning in that the “anointing destroys (KJV) the yoke” , and yesterday during my prayer time. #2 & #3 – I woke up from a dream this morning, repeating over and over, “He WANTS to save us” meaning that of course, He CAN but so many question His willingness to do so. Bless you!! This is a season for me of Him pouring His word into me like a river, and I can barely keep up… believing for a voice and a ministry to pour it into others. A few years ago, the words “willing and able” became so important to me. Of course, we know that He is able but He is also willing. Yes, He WANTS to save us! The light of the Lord shines in our darkness, I feel a praise dance coming on la la la lllaaaa laaaa llllaaaa la la oh my God You are good, thank you for remembering even me………………. It is wonderful to know that my God thinks of me. They are all for me. Praise God. All three of these prophetic words are in my spirit. You are such a blessing to me. You are a delight. Thank you for your truth which are in you. #2 & #3 …Just read my prophetic declaration for today and it was speaking exactly on #3 arise & shine….Thank you Father for confirmation and Your Word..
Great words, I receive them. # 1 especially, my grandfather had a saying he was fond of, ” My hands are tied. ” He was saved before he passed. I know it meant he didn’t have any money or couldn’t do anything about it. I just read about how they bound Jesus in John a wrote a post on it, but He is loosed now isn’t He? His hands are never tied. All 3 spoke to me. I thank you Jamie for this word today. I felt this was a word for me. I bless you my Angel and your baby and your family, ministry. #1 fits into my situation , I give God glory and thank you for being a willing vessel in His hands. More anointing in Jesus name. Thank you so much Jamie for these words. I feel nrs. 2 and 3 are for me. All three resonate in my spirit. Abba told me the road is clear!!! All three spoke to me because I’m in a number one situation. Thank you Jamie! Thank you Jesus! hi, Jamie and thank you for the word and #2 really touch me because i think and feel like papa is pushing a provision toward me because i been struggling with my faith and spiritual walk with papa and im praying for wisdom and understanding in this walk i want to learn it apply it and live it and show it then i can teach or share it . and thank you i was truly blessed . Hello Jamie, this is my first time sending a comment. I wanted to tell you that you I so enjoy your site. Thank you for all that you do you have pick my feet up and set them back on the ground for me. All 3 words has hit me and they are just what I need right now. Thank you and Thank you Father for loving us through your faithful servents. Thank you so much for reading and commenting, Sherri! So glad you’re part of this community! Amen to all 3 . Yes and Amen! The words I needed for this season that I am in. Hallelujah! God bless you ! All three words were so meaninful to me. I live in Rio, Brazil and I’m facing such difficult times in my life. But the Lord is my Shepard I shall not fear! Thank you for these encouraging words , may the Lord blesses your ministry deeply ! 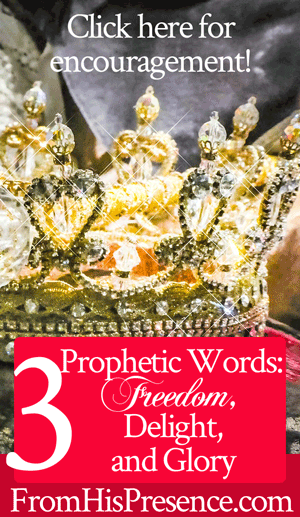 Prophetic word #3 is confirmation of what I hear the Spirit say! Isaiah 60:1!!! Glory be to God. I bless God for you Jamie. God is speaking to me through you. I have been in the wilderness for a long time and now is my time to rise and shine for the glory of God has risen upon me. You have a real gift and a talent Jamie. It’s much appreciated. Your words resonate with me. I feel you will be growing in glory yourself. Acts 2:1-4 + When the day of Pentecost came, the believers were all together in one place. Suddenly a sound like a mighty rushing wind came from Heaven and filled the whole house where they were sitting. They saw tongues like flames of a fire that separated and came to rest on each of them, and they were all filled with the Holy Spirit. Joel 2:28-32 + And it shall come to pass afterward, that I will pour out My Spirit on all flesh; your sons and your daughters shall prophesy, your old men shall dream dreams, and your young men shall see visions. Even on the male and female servants in those days I will pour out My Spirit. And I will show wonders in the heavens and on the Earth, blood and fire and columns of smoke. The sun shall be turned to darkness, and the moon to blood, before the great and awesome day of the LORD comes. And it shall come to pass that everyone who calls on the name of the LORD shall be saved. For in Mount Zion and in Jerusalem there shall be those who escape, as the LORD has said, and among the survivors shall be those whom the LORD calls. John 3:8 + The wind blows where it wishes, and you hear the sound of it, but cannot tell where it comes from and where it goes. So is everyone who is born of the Spirit. 4 – GOD’s Word was created for us by the Holy Spirit. Christ JESUS. All Scripture is GOD-breathed and is useful for instruction, for conviction, for correction, and for training in righteousness, so that the people of GOD may be complete, fully equipped for every good work. So I believe GOD’s holy angel was telling me two things in my dream. 1 – The Call: GOD continues to pour out His Holy Spirit upon me like a mighty rushing wind. He has infused His breath of new life within me through JESUS Christ. He has sealed me as His child; and by His Holy Spirit, He has anointed me for His service and called me to do His mighty works by the power and authority of that same Holy Spirit. 2 – The Word: I need to continually read, study, obey, apply, and put into action His Holy Scriptures, all of which He has breathed into being by His Holy Spirit, for counsel, wisdom, instructions, protection, power, and guidance so that I will be fully equipped to fulfill the missions and purpose for which GOD has created me. And when I say “me” I mean all of us who know that these prophetic words were meant for us. All 3 prophesied hit my heart, mind and soul!!! The words confirmed many things Father has already told me. The part about me doing what He’s commissioned me to do and that I don’t need to move forward with my mission and the ones that I’ve been praying for to join and wa ngs to remain in darkness to let Him take care of them. That s exactly what I am doing. GOD bless your obedient heart and may FATHER continue TO BLESS YOU eternally. Wow! Number 1 is exactly where I’ve been for years! Number 2 is my heart towards Him! I simply get lost in His Heart! Amen! you indeed and truly God sent Jamie….thank you for such powerful and soothing prophetic words… all the three were meant for me especially number 1.
may God continue blessing you as always. Thank you Jamie– #3 speaks to my heart and I know the Lord will do exceedingly and abundantly above all that we ask or think in Jesus Name! This post was right on for me….On Sunday after church I saw myself standing on Jesus thighs and he was holding me outwardly as my hands were raised in the air…kind of like my cheerleading days and He was turning me slowly…WOW!! THEN I read your post to run to Jesus like a child and let him spin you!!!! And this post was day 1…Sunday!!! LOVE KNOWING THAT JESUS IS WITH ME!!! Glory Glory, praise unto the Lord. The Holy Spirit has been singing to me a song of childhood, ‘this little light of mine, I’m gonna let it shine’ as I’ve been going through spiritual warfare unlike any I’ve ever seen in my walk. #3 caused the very depths of my soul to recognize the Father’s voice. Hallelujah, Glory to our Heavenly Father. This speaks directly to the ministry He has given and the small business He had given me to make provision for finances to break me free from the world’s greed. I kneel before Him to receive all that He has called me too do for His glory, for His children. Thank you Jamie as I know it is such a time as this that I am seeing this tonight.